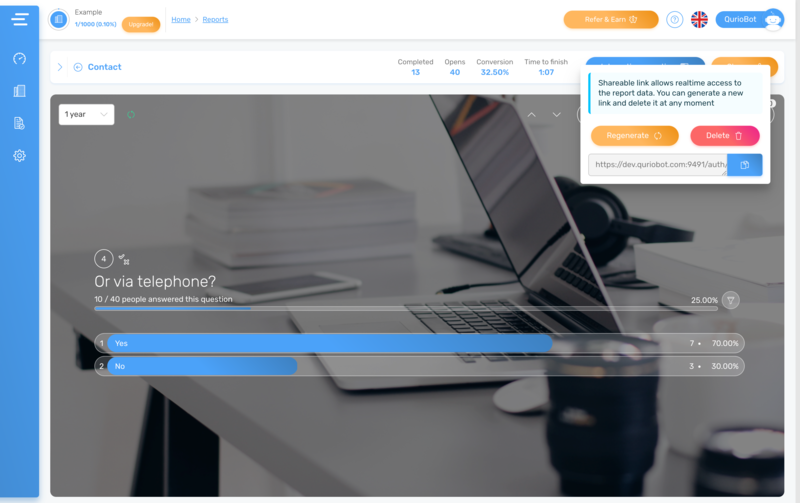 Quriobot | Agencies – Building your own chatbot is easy! You’re in good hands: hundreds of agencies have already built Quriobots for their clients. They build them in their own or in their client’s account (s) and they make sure clients have full control over collected data, bot behavior and integrations with existing systems. It’s up to you whether you manage everything for them as a paid service or whether you enable them to also edit and build Quriobots themselves. Within your account you can create organizations for your clients. You can invite your clients to their own organization and apply different levels of access: administrators, editors or you can assign ‘view only’ rights. Each organization has its own plan which you are in control of. You can pay for the organization yourself or your clients can directly pay themselves. Up to you! With the available reporting features you always make sure that your clients have access to their data, statistics and results. You can invite them to their own organization in which they can access their data, but you can also send them unique links to reports so they have access to their statistics 24/7. It is possible to share multiple reports per bot: progress over time reports, interactive reports, downloadable results and more! Quriobot for agencies allows you to control you spend since you are charged on a 'per organization' basis. Think of it as a 'pick and mix' approach. You set the plan and amount of chats per organization individually. You can downgrade and upgrade your client plans at any time directly from your account. Adding more organizations means a 10% discount on the monthly fee! Click here to view the pricing. How much does it cost to use Quriobot with my clients? Can I give my client access? Yes, you can invite your clients to only access data within their organization in the Quriobot platform. You can also let your clients manage bots within their organization. Your clients will not be able to access any other data or other organizations in your account. Always make sure that each client is set up with their own organization. How do I use Quriobot on my clients' sites? There are two ways you can use Quriobot on your clients' sites. You can invite your clients to set up their own account (they will manage and pay for themselves) while you also get access to their data, reports and bots. Alternatively, you can manage and pay for your clients' accounts by adding them directly to your own account as separate 'organizations’. Can I offer a custom branded interface? 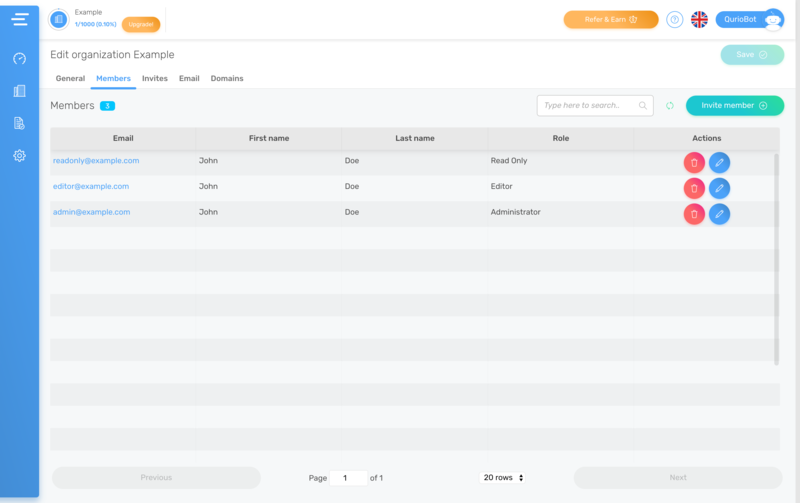 You can replace the Quriobot logo within the admin interface with your own organization logo. Any client using the Quriobot Business plan can also remove the Quriobot logo from all bots. 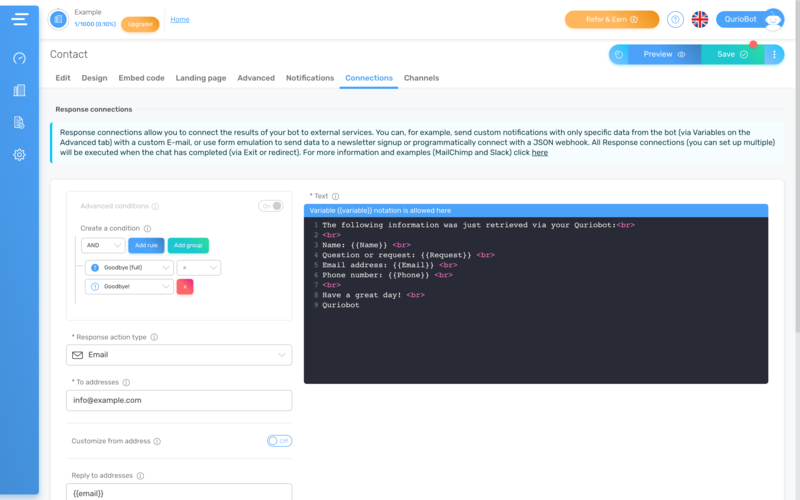 Quriobot was built with agencies and consultants in mind. Amongst other things, this means you can setup and manage an unlimited amount of clients. Do I need to have my own plan? You can have a free plan yourself while selecting Business plans for your clients.